Equipment can get in the way. I spent quite a bit of time in the early part of the flight messing with the plane’s autopilot. With a long flight ahead I decided I wanted this one to fly itself quite a bit of the way. But for some reason I couldn’t get it to arm for either altitude or navigation / heading. The Carenado autopilots typically play well with Saitek gear, so this was confusing to me. Eventually, about at the outskirts of Las Vegas, I said to heck with it and flew manual the rest of the way. With the winds this was like riding a wild horse, and it was fatiguing. After doing some research I learned that continued trim input can cause the AP to disengage. I did have the aileron trim tab set, and will test today to see if that in fact was the problem. Don’t forget to actually set the squawk code. I kept waiting to hear “radar contact” from Center but it never came. When I finally asked if they had me they said, “no” and told me to cycle the transponder. I saw I was still squawking 1200, and when I suggested that actually setting the code might help I and the controller had a laugh. Equipment failures happen. On this flight, the display on the FIP that shows my wet compass froze. I futzed with it some then flew via only the G1000 glass cockpit on the iPad. But the buttons on the FIP still seemed to work. I use those to toggle the COM and VOR radios, and in pushing them to see what was what I unknowingly switched over to COM2. After wondering where LA Center was for a while I switched back over to COM 1 and asked if I’d blown through a transition. They said no, but that they’d been looking for me. The redundant system on this is the light on the attenuator panel. That’s not working, and I need to fix it just as I would in a real airplane. … wind and visibility are real complications. The wind was still howling on the descent, some 20-25 knots, and the plane was all over the place. And Active Sky 16 did a great job of rendering the haze in the LA valley, which limited visibility to about 10 miles. All told, it made for a very stressful, if still simulated, descent between holding onto the airplane, avoiding the Bravo and Charlie airspaces, and not being able to see very far. So distracting, in fact, that the aircraft got too fast and crashed, I think from exceeding the NTE speed. Good thing it’s a simulation, and luckily P3D quickly reloaded so I could continue (you can see this point in the flight path as the little jog in the line above the high 60 marker). Controllers can make mistakes, too. The Long Beach tower first gave me one approach, then realized they had the wrong airplane, so they gave me another approach. I though I was too close to the field to make the left hand turn it would require, so I looped north to make the right base into 25L. This confused him, too, but he said no worries and told me to just to head to the numbers for landing. 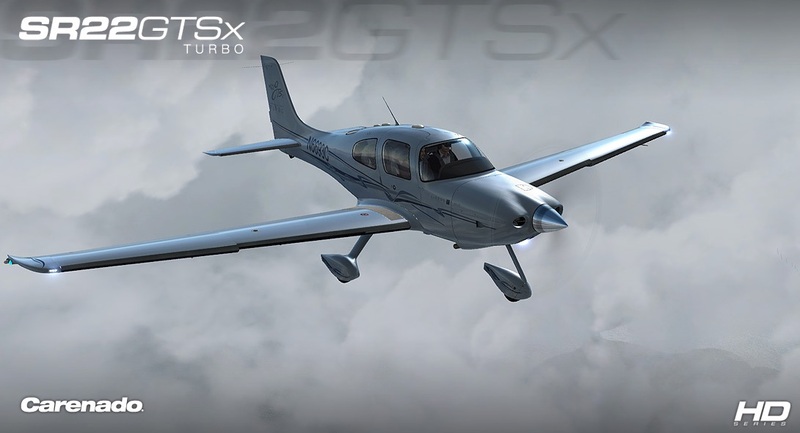 And finally, high-performance aircraft are a different kettle of fish, even in a simulator. Once I was in descent everything in the Carenado seemed to happen very, very quickly. There’s a big difference between 100 or 120 knots in a Cessna 172-182 and 150 knots in the Cirrus, and this is more true on final where you’re coming in at 90 instead of 65-70. I landed the thing, but with the wind and the speed it was rough going. You have to really be ahead of the game not the let the airplane get ahead of you. All told, the flight felt like a workout, and a very useful training session. The great thing about the sim and the software is that conditions can get quite real, and they can require real decision making. This flight had a lot of them, and I felt like my training brain was working nearly the entire time. I suspect that’s valuable as a student pilot. At least, I hope so. 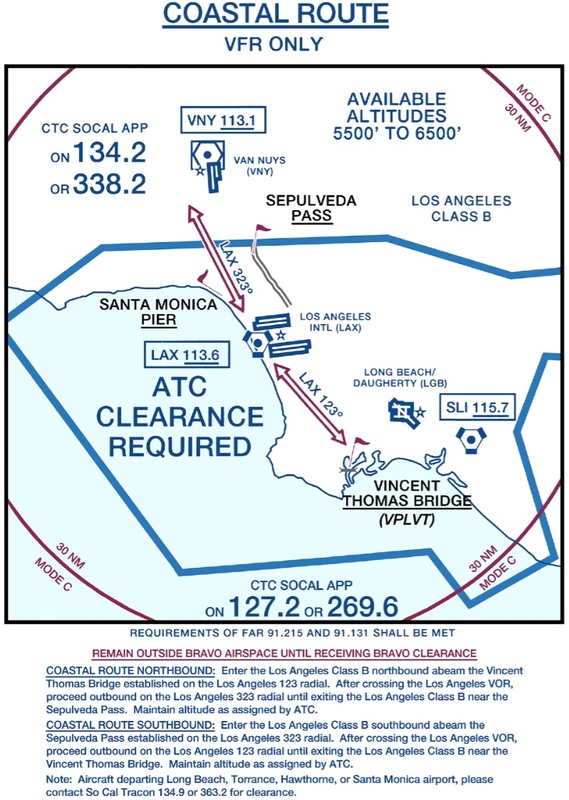 The next flight is Long Beach to Montgomery Field. 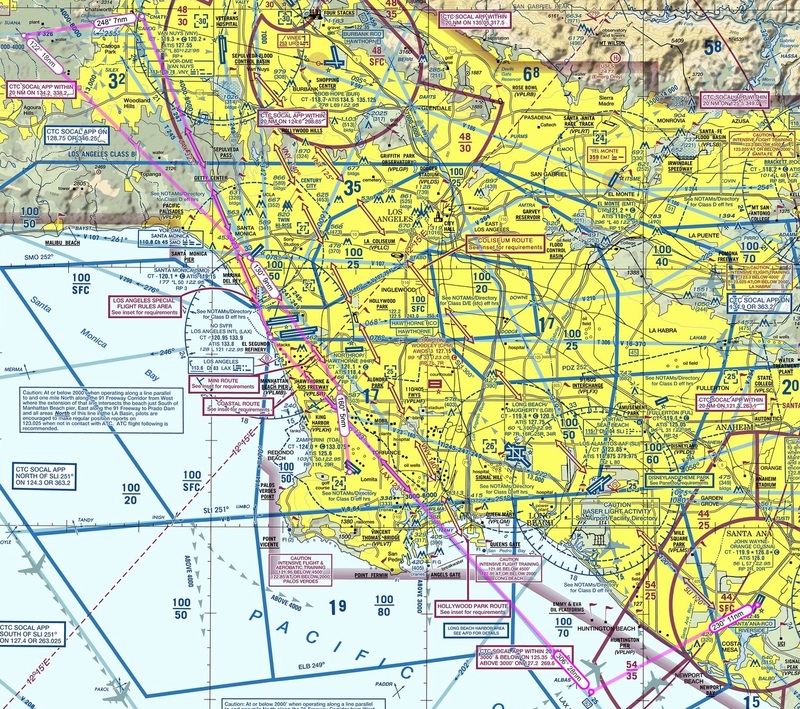 This will be my first flight on Pilot Edge into the San Diego area, and I’m looking forward to it. And here’s the challenge progress so far. 112 pilots have started the challenge, and only 59 have made it this far. I’m happy to say that today I completed the V-3 VFR rating on the PilotEdge ATC network. This is the most challenging of the visual flight rules ratings, and I’m proud to say I passed it on the first try! and then ultimately land at Torrance (KTOA). 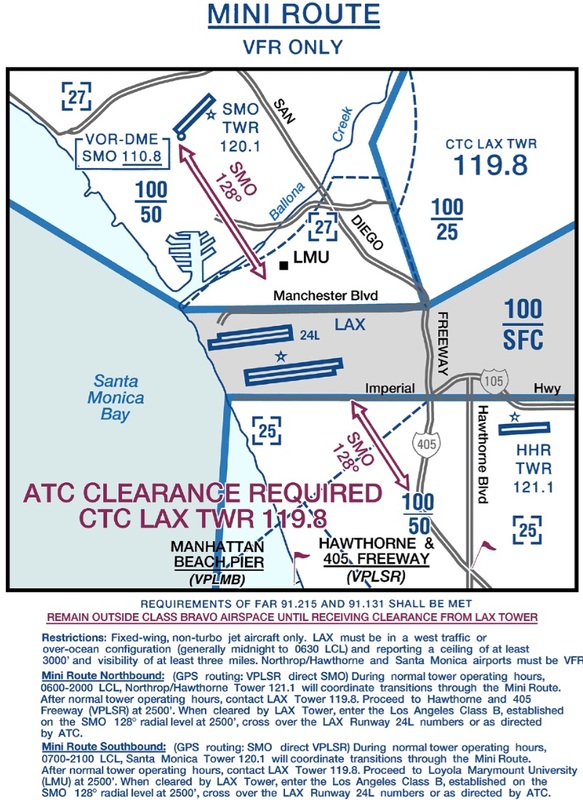 The pilot is not permitted to land at any airports prior to landing at Torrance. Again, you can click on that chart to make it larger. 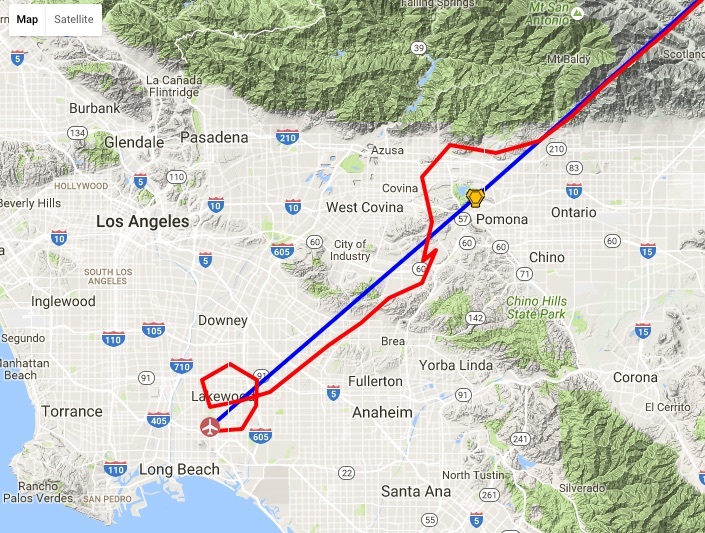 The four primary transitions are the Coastal Route, the Mini Route (which goes directly over the LAX tower and is quite narrow), the Hollywood Park Route, and the Colosseum Route. 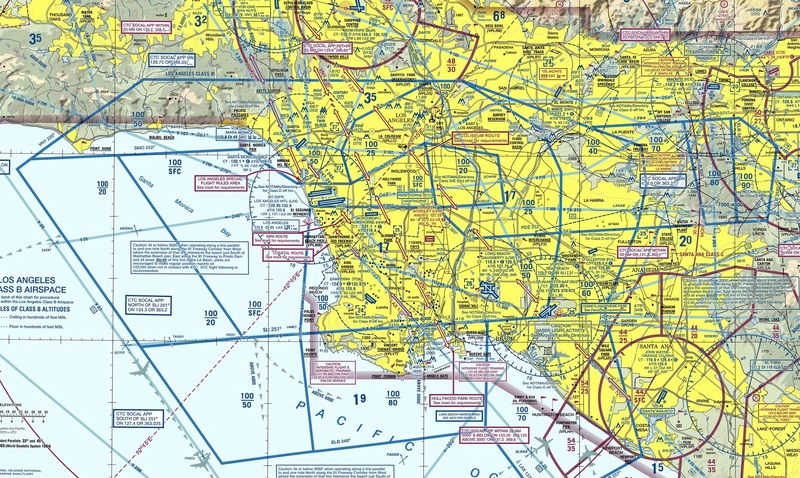 Each has its own set of rules and altitude, because as you can see in the 3-D image of the Bravo there are a lot of places where you can fly under the Bravo, most notably right over LAX itself where the Bravo is most narrow (which make sense because there all the traffic is arriving or departing from the East or West). PilotEdge records all their radio shifts to help with training, and I went back and pulled the mp3 files and edited together the calls for my flight. You can listen to it by clicking the play button below, and my call sign is Skylane 15 Juliet Golf. The PE software does a nice job of automatically deleting any dead air, so it’s compressed significantly from the actual flight time of just under an hour. I say that also so nobody thinks PE is always this busy, although sometimes it is. 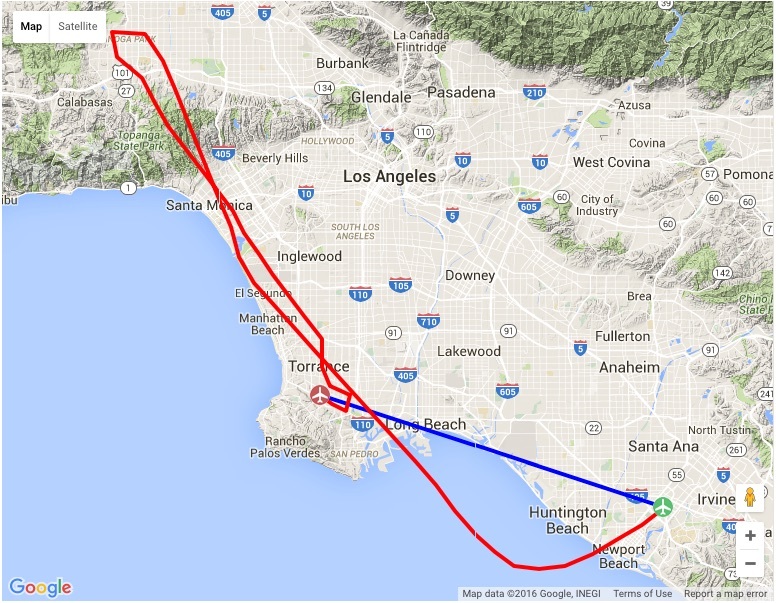 I hope you like listening to it, and thanks for reading about my PE flight across the LAX Bravo. 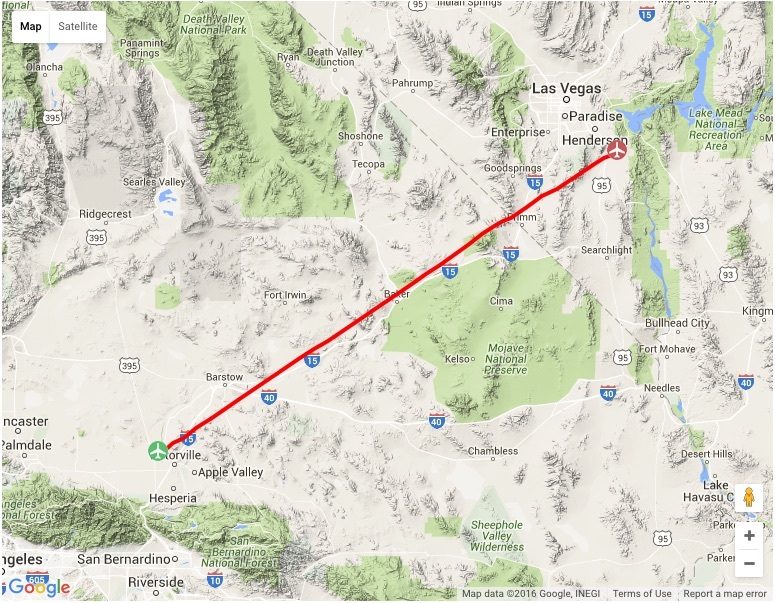 Last night on PilotEdge I decided to fly from Victorville, CA to Boulder, City, NV (just outside Las Vegas). 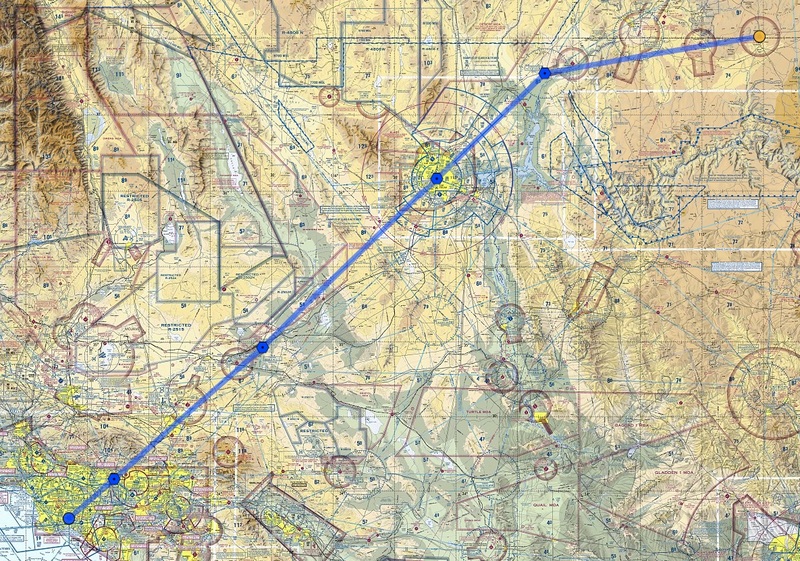 This is the first leg of a two-leg trip VFR PilotEdge flight from KVCV to St. George, Utah. KVCV is the old George Air Force Base, and is now a towered public field working as Southern California Logistics. My Dad was based at George in the early 1960s as a doc in the Air Force, and while it was before I was born, stories of going “over the hill to Victorville,” and the realities of high-dessert 1960s base life, still run through our regular family mythology. While this was a VFR flight, I did file a flight plan online via PilotEdge so I could log and track the flight on PEaware. 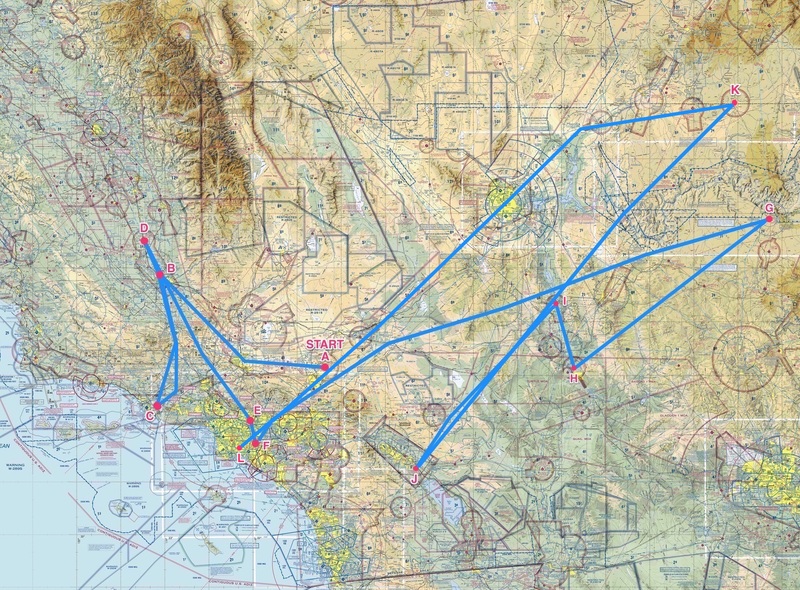 The sectional chart below shows the flight, and I planned it as direct GPS, 140 knots, 7,500 feet (necessary to keep from running into the shoulders of Clark Mountain). 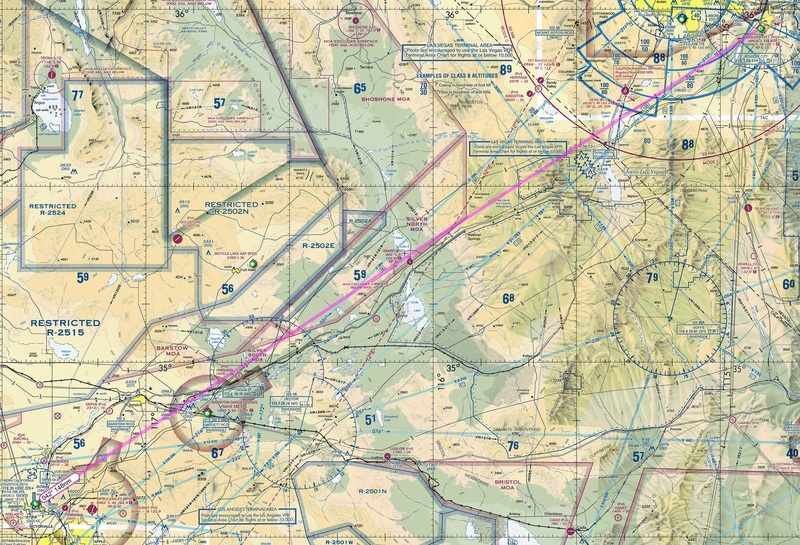 Other things to manage on this flight included getting clearance to fly through the Silver North Military Operating Area, avoiding the Las Vegas Bravo airspace, and arriving at Boulder City in the dark. You can click that chart image to see it full-sized. The route and vertical / speed profiles are below. 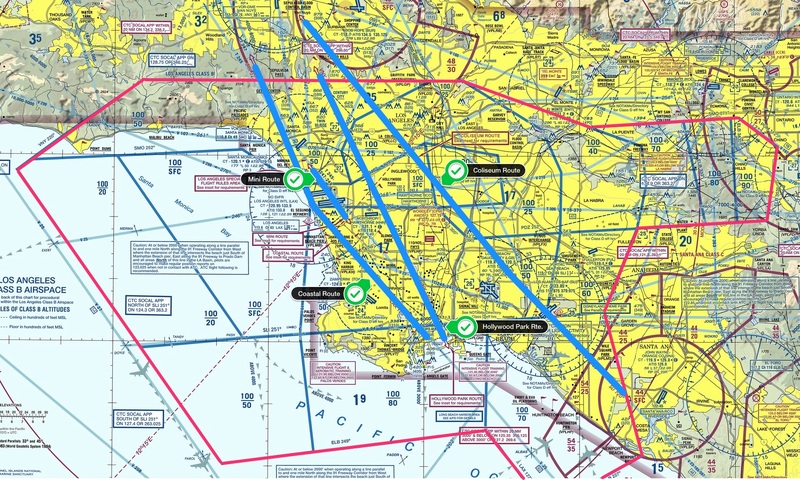 I used ATC flight following the entire way, which is a smart thing to do because it’s safer, and it makes the handoffs near a Bravo like Las Vegas a bit less worrisome for pilot and ATC (you know they are watching, and they know you know where you are going). The PilotEdge side of things went well, save three small mistakes: I called to Joshua Departure before switching over from KVCV tower, I addressed Las Vegas Approach as LA Center for half-second before correcting myself, and when I went to the KBVU CTAF I told LV Approach I was going to their tower (when there is no tower). I was already correcting myself when the controller said, “I don’t think you’ll find a tower at Boulder City, but you’re welcome to try.” What can I say, it was late. Still, it goes to show that PilotEdge is an excellent training tool, and I learn something every time, even if just listening to the traffic. It can’t be beat as a simulation add on. On this flight as well, even though it was a simulated experience, some family history came back. The Orbx scenery is realistic enough that as I overflew the dry lake beds of Silver Lake and Soda Lake, I recalled stories my father has told about taking a light plane from George AFB during the Cuban missile crisis, and flying out into the Mojave to scout lake beds where he could land and caves where he could stash the family if the bombs started to fall. And they nearly did. He knew to make that flight when he came home one day and all the F-104 pilots had their flight bags packed and sitting on their doorsteps. They were taking on nukes and flying to Florida. Chilling times, ones I hope never return.